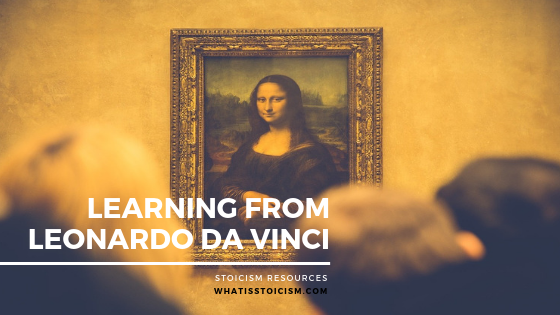 Learning from Leonardo da Vinci - What Is Stoicism? If you’ve ever heard the name Leonardo da Vinci, the first thing you’ll probably associate with the famous Italian is painting. His masterpieces are some of the most well-known works of art in history. The Mona Lisa, The Last Supper, and Salvator Mundi (the most expensive painting ever sold) were all produced by the careful strokes of Leonardo’s brush. What you might not know, indeed what surprised me, is how many other disciplines he ventured into. In addition to painting, he was also highly skilled in invention, sculpting, architecture, science, music, mathematics, engineering, literature, anatomy, geology, astronomy, botany, writing, history, and cartography. This obsession allowed his many interests to overlap. His research of anatomy and geology would inform his painting, while his love of science and engineering gave him countless ideas for inventions. The endearing thing about Leonardo is that none of his efforts were for fame or fortune, which Isaacson reminds us of throughout his book. Stoic wisdom is also referred to as prudence – in other words it is wisdom with practical application. It’s the ability to discern the appropriate course of action to be taken in a given situation at the appropriate time. Leonardo da Vinci’s attainment of wisdom gave him the happiness that Donald Robertson refers to. At times he learnt for learning’s sake, going down rabbit holes of investigation simply for the joy of discovery. Additionally, the more he learned, the better informed he was to make decisions, and the better the results of his endeavours. Throughout his life, and especially as he got older, Leonardo’s focus was on doing what was right for him at the time. Even as a highly sought-after painter, he was able to decide whether to accept lucrative job offers based not on their monetary value, but simply on whether he would enjoy the project. It was that attitude that denied Isabella d’Este the privilege of having her portrait painted by the great da Vinci. A wealthy patron from an esteemed family, she could have rewarded Leonardo handsomely, however never one to be tied down, he evaded her desperate and relentless pursuit of his talents, preferring to work on other projects. Leonardo always had a notebook to hand and compulsively jotted down theories, reminders and instructions for himself. These were often accompanied by detailed sketches to add greater perspective to his ideas. Over 7000 pages of his notes have survived and they give unrivalled insight into a genius’s search for wisdom. In similar fashion, Marcus Aurelius’s Meditations are a collection of the Roman Emperor’s notes that were never intended to be read by anyone other than himself. In what later became one of the great Stoic texts, Marcus was constantly instructing himself based on his experience of the world, building his wisdom as the years passed. To further his knowledge of Stoic philosophy , Marcus Aurelius was a keen reader of Epictetus’s teachings and realised the importance of learning the theory before writing about it himself. Today, we can’t hope to practice Stoicism to its fullest without reading the work of Marcus and Epictetus (and Seneca). “While you are alone you are entirely your own master,” noted Leonardo on one of his many pages. Never one to chase the big payday, he placed much more value on time. On numerous occasions he turned down prestigious commissions in favour of pursuing something else he happened to be interested in. This enjoyment of his own pursuits may have limited his artistic output, but it made his life richer. As Epictetus said, “No man is free who is not master of himself.” Leonardo da Vinci was a master of many disciplines, but he never became a slave to possessions, profit or pushy potential patrons. A key tenet of Stoicism is learning to want what we already have, to appreciate what is around us on a daily basis. The idea is to alleviate the constant feeling of dissatisfaction that accompanies the desire for more. More possessions, more profit, more patrons prepared to pay.